A USBGF BG Shop exclusive! Absolutely gorgeous transparent baffle box with the beautiful USBGF logo etched on the front. Be the envy of your friends at your local backgammon club, or stand out at the next ABT tournament. Everyone will ask you where you got this stunning baffle box! Optional zippered carrying case at additional charge. 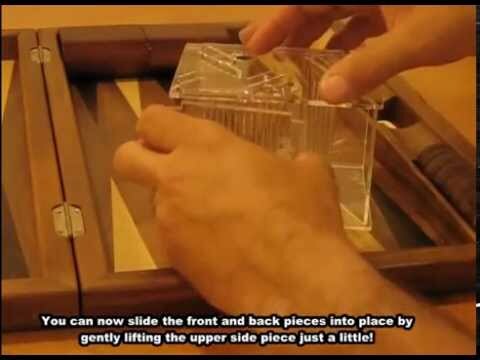 The New Acrylic Travel Baffle Box for Backgammon players on the go! This new design incorporates a revolutionary new baffle design that produces more action against the dice edge to promote more rolling and turning to generate more random rolls! It’s smaller, lighter and lock together with two locking keys. Now you can setup your baffle box on your board and not worry when someone comes by and picks up your baffle box, it will stay together in one piece! You can shake it and move it and it will stay together! It’s made from a durable 1/8″ clear acrylic. This new design is specifically made for travel and easy assembly. The entire baffle box can be disassembled and placed in a bag where it will lay flat on the inside of your backgammon board. The thickness without the bag is less than an inch thick! When finished playing the baffle box disassembles in a flash and easily stacks together in a nice group to be slid into the bag. If you are a serious backgammon player and understand the importance of a clean, random roll than this is the box for you. The baffle box AKA dice tower, is nice. The deluxe model has a soft material that increases the roll rate. Is it worth $70. Not really. The “carry case” is a cheap plastic zip cosmetics type bag. Definitely not worth $10. I consider the overpayment a donation to usbgf. As an owner of a Simborg baffle box, I can say they are outstanding! This new design is much easier to assemble and the USBGF logo looks absolutely fabulous!